Beef tongue is often seasoned with onion and other spices, and then placed in a pot to boil. After it has cooked, the skin is often removed, and the rest of the tongue is served. 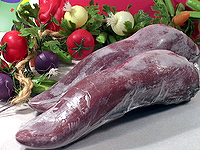 Pickled tongue is often used by the preparer because it is already spiced. If cooked in a sauce, it can then later be reused as a sauce for meatballs or any other food item. Another way of preparing beef tongue is to scald the tongue in hot water and remove the skin. Then roast the tongue in an oven similar to a roast beef, including using the pan drippings to prepare a gravy. In Belgium, beef tongue will usually be prepared with mushrooms in a Madeira sauce. In Poland and Germany and Austria is served with horseradish sauce.